The Nursery Wittians at WIS, Udaipur witnessed and participated in an intera class Poem Recitation Activity. It was nice to see the little Wittians coming upon the stage with confidence and confronting in the audience. Very beautifully they had recited the rhymes. Their recitation depicted the concepts taught of wild animals, shapes, marine life, and insects pet animals etc.Students came beautifully dressed in the characters of their poem. It was not only the attire that was added to their recitation but also the props that were related to the poem were the part of their recitation. 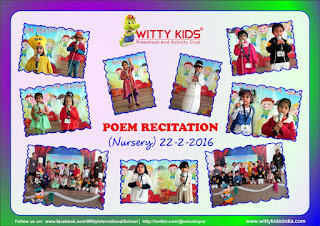 A good learning experience was exhibited and enjoyed by the Nursery Wittians.